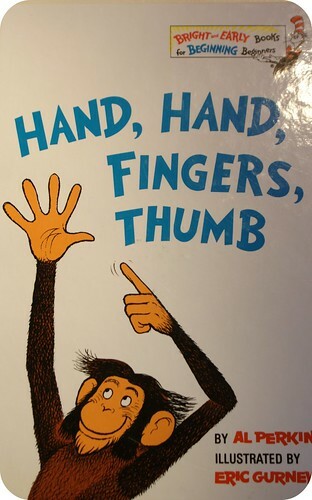 Are you familiar with the book Hand, Hand, Fingers, Thumb written by Al Perkins and illustrated by Eric Gurney? We certainly are. We used this book for inspiration when designing O's room. The book is a wonderful rhythmic book about drumming monkeys. We had borrowed the smaller board book version of this from a friend of O's and fell in love. Interestingly enough, now O's friend has a little sister who is turning 1 today and she loves this book even more than her big sister ever did. We're heading off to her birthday party today so I wanted to make her a special custom monkey inspired by the book. 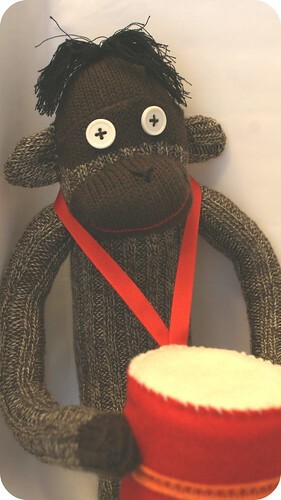 He's a standard monkey with magnets in his hands but I also added hair and (obviously) a drum. The drum has magnets in the sides so he can hold on tight to his drum. 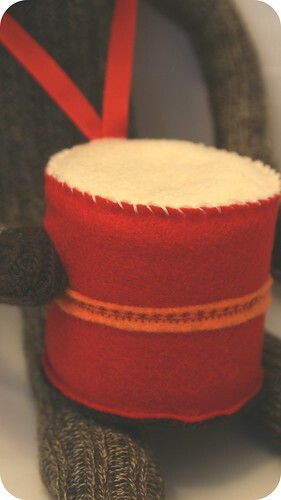 The drum doesn't actually make any sound (you're welcome D. family) and is filled with foam so it is soft and squishy. I knotted strands of DMC embroidery floss through the top of his head then combed it out to separate the strands to make his hair. 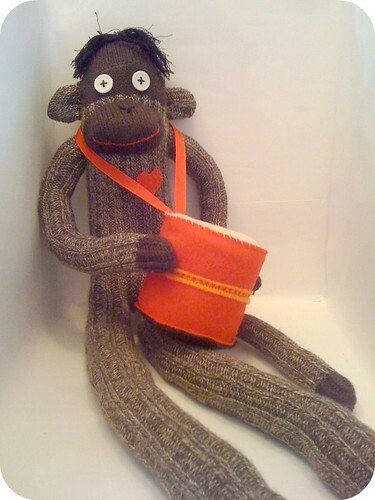 I might have to start adding hair to more of my sock monkeys, I like the silliness of it. Super cute. I love that he has a little drum! Thanks. The book is such a fantastic rhythmic story, I just couldn't skip the drum aspect of it. This is awesome! When my boys were little, we used a dinosaur book as a template for decorating their room. I am not that handy with a needle and thread however, I am so envious of your skill!